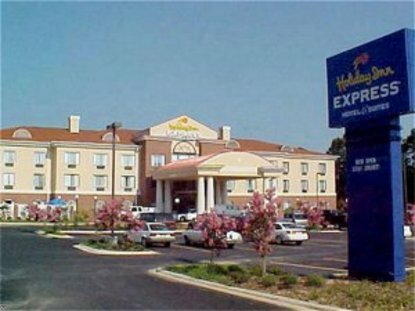 The Holiday Inn Express Hotel & Suites Forest, MS. is located directly off of I-20 at exit 88. This Mississippi hotel is centrally located 45 miles west of Meridian, MS. and 45 miles east of Jackson, MS. Short driving distance to Bienville National Forest, Scott County Coliseum, Roosevelt State Park, Forest Country Club, Cherry Hill Golf Course and Gaddis Recreation Park.The 62-room hotel features Jacuzzi rooms, outdoor pool, business center, fitness center, free hot breakfast, a coin operated guest laundry, and a meeting room. Our guestrooms also feature free wired high speed Internet access, expanded cable channels, work desks with ergonomic chairs, two 2-line telephones, voice mail, data ports, microwave and refrigerator, and coffee maker. All our spacious suites are equipped with a sleeper sofa and a bar sink. Our friendly and efficient staff is here to serve you. We welcome Priority Club and senior discount members. This hotel is committed to providing accessible facilities under the American Disabilities Act. If your accessibility needs are not met, please contact the Hotel Manager on Duty. Should you require additional information regarding accessible facilities for guests with disabilities, please call 1-800-Holiday (U.S. and Canada) or contact the hotel directly. For the hearing impaired, TDD service is available at 1-800-238-5544 within the U.S. and Canada.